With the increased weighting on summary and note-taking for the new Cambridge IGCSE® English as a Second Language exam, this resource ensures students get plenty of practice. Includes a section devoted to Core level, providing differentiation between ability levels. 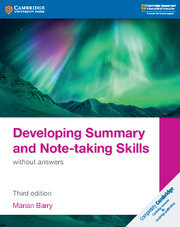 Combines practice in summary and note-taking with guided help across six themes. Mark schemes and model answers help students understand how to structure their responses for the examination. First language students can also use this book to develop their skills.